Are you in need of dental implants or another restorative dental treatment? Dr. Poulos and Dr. Stevens at My Scottsdale Dentist provide a friendly and comfortable atmosphere along with the latest and greatest technologies covering all types of restorative dental services including dental implants. You will enjoy distinct dental care that will enhance the quality of your life as well as your family’s. 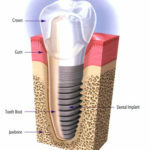 Call (480) 614-1122 for a Free Dental Implant Consultation! Dental implants are a great way to replace missing teeth and also provide a fixed solution to having removable partial or complete dentures. Implants provide excellent support and stability for these dental appliances. Dental implants are artificial roots and teeth (usually titanium) that are surgically placed into the upper or lower jaw bone by a dentist or Periodontist a specialist of the gums and supporting bone. The teeth attached to implants are very natural looking and often enhance or restore a patient’s smile! If, like many others, you feel implant dentistry is the choice for you, we ask that you undergo a dental/radiographic examination and health history. During these consultation visits, your specific needs and considerations will be addressed by your surgeon. Your questions and concerns are important to us and our team will work with you very closely to help make your procedure a success.